Product Management Usability Testing 6th February 2006. 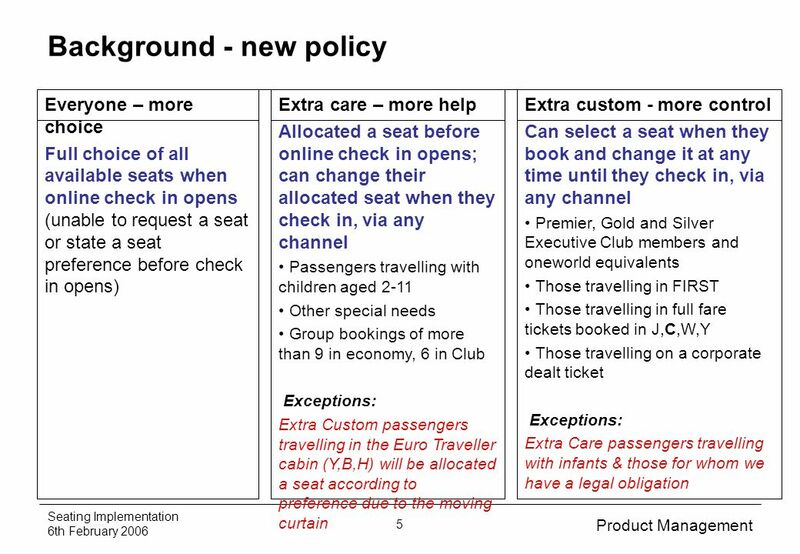 6 Product Management Seating Implementation 6th February 2006 6 Background - principles of the new policy Eligible passengers are able to choose from ALL available seats. 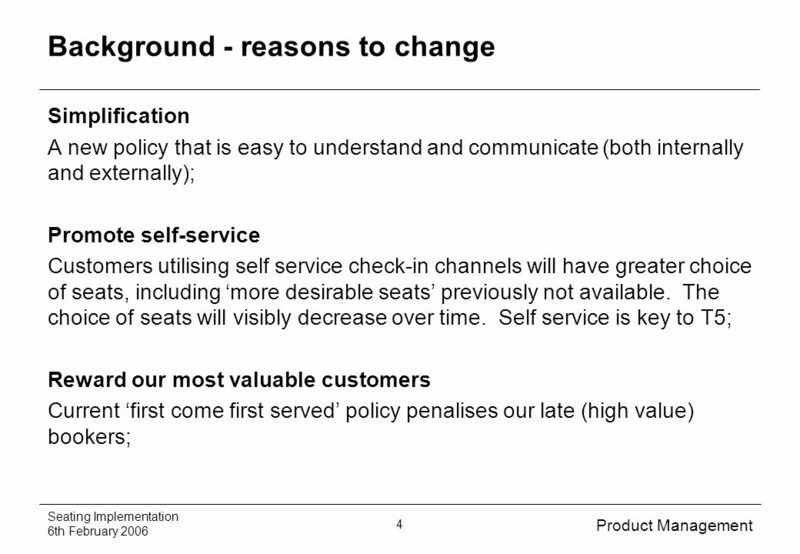 Previously we held seats back; Far more seats will be available through online check-in (eg. 28 in old policy, 194 in new!) 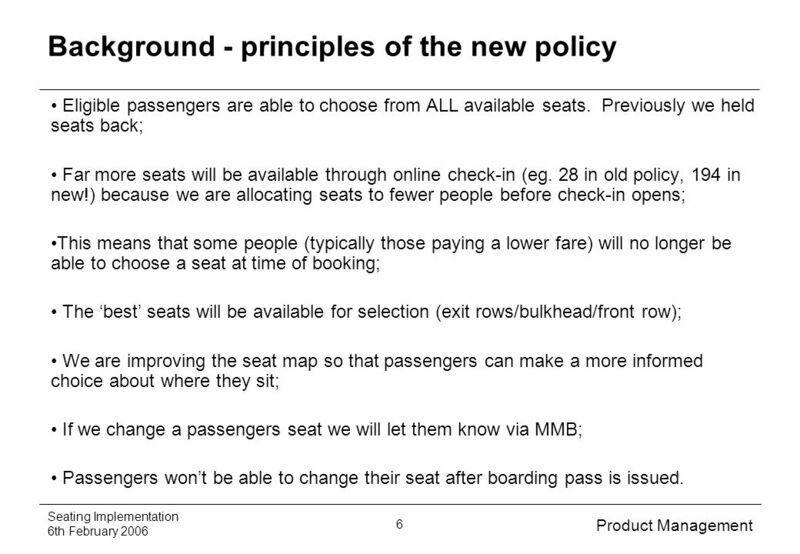 because we are allocating seats to fewer people before check-in opens; This means that some people (typically those paying a lower fare) will no longer be able to choose a seat at time of booking; The best seats will be available for selection (exit rows/bulkhead/front row); We are improving the seat map so that passengers can make a more informed choice about where they sit; If we change a passengers seat we will let them know via MMB; Passengers wont be able to change their seat after boarding pass is issued. 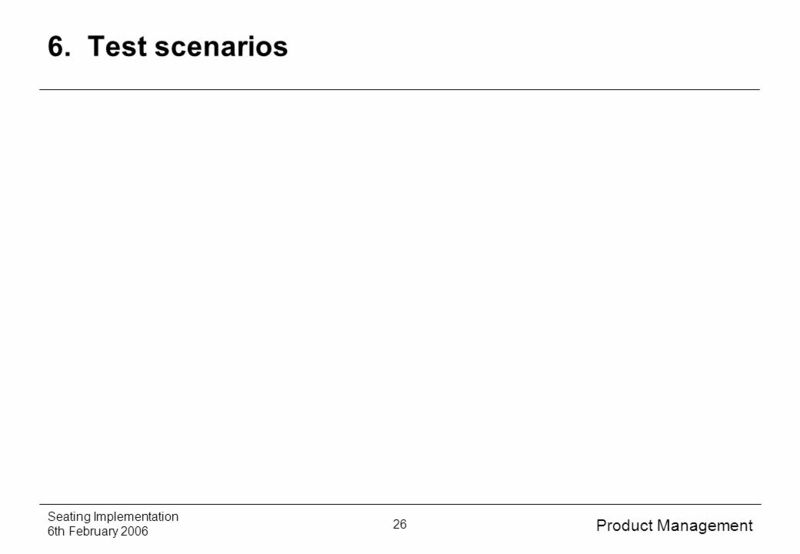 10 Product Management Seating Implementation 6th February 2006 10 4. 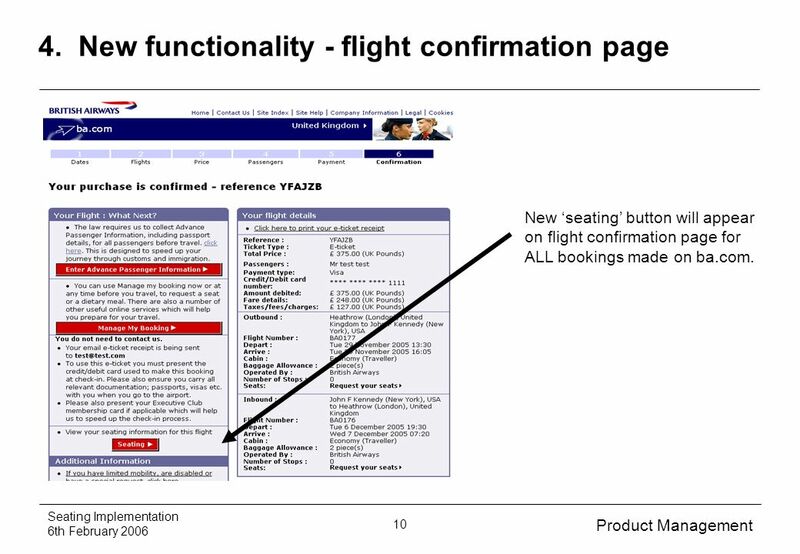 New functionality - flight confirmation page New seating button will appear on flight confirmation page for ALL bookings made on ba.com. 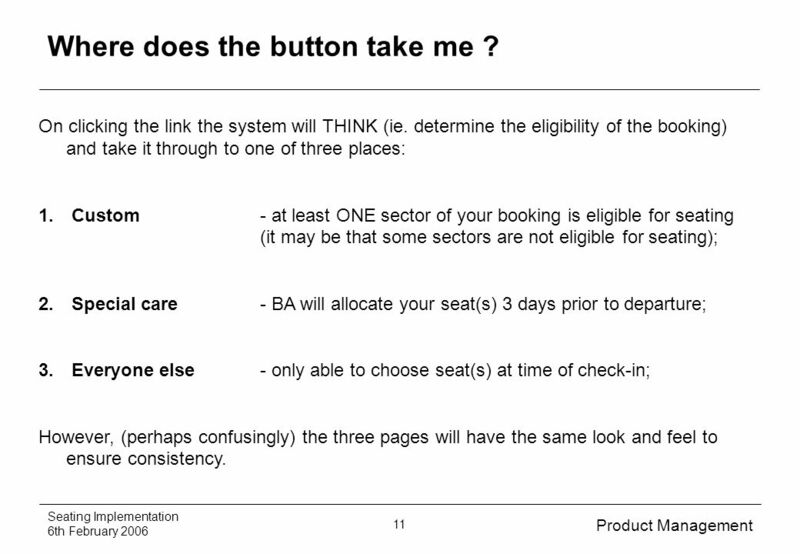 11 Product Management Seating Implementation 6th February 2006 11 Where does the button take me ? On clicking the link the system will THINK (ie. determine the eligibility of the booking) and take it through to one of three places: 1. 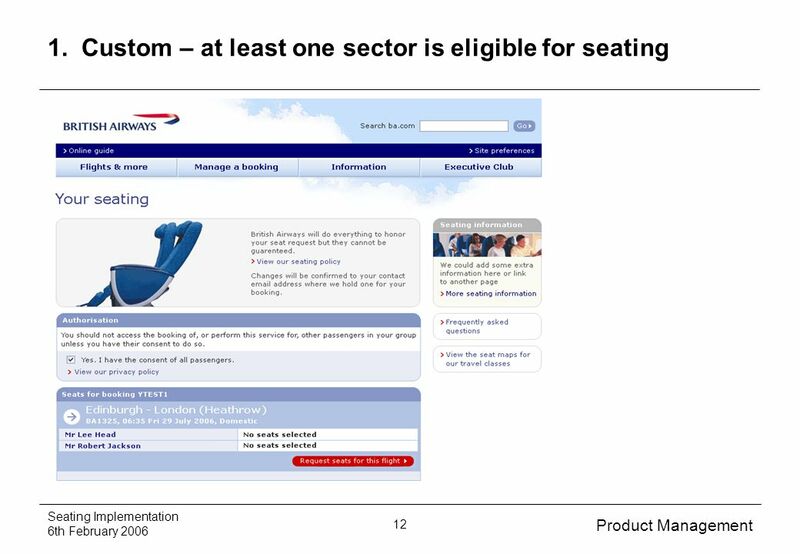 Custom - at least ONE sector of your booking is eligible for seating (it may be that some sectors are not eligible for seating); 2. Special care - BA will allocate your seat(s) 3 days prior to departure; 3. 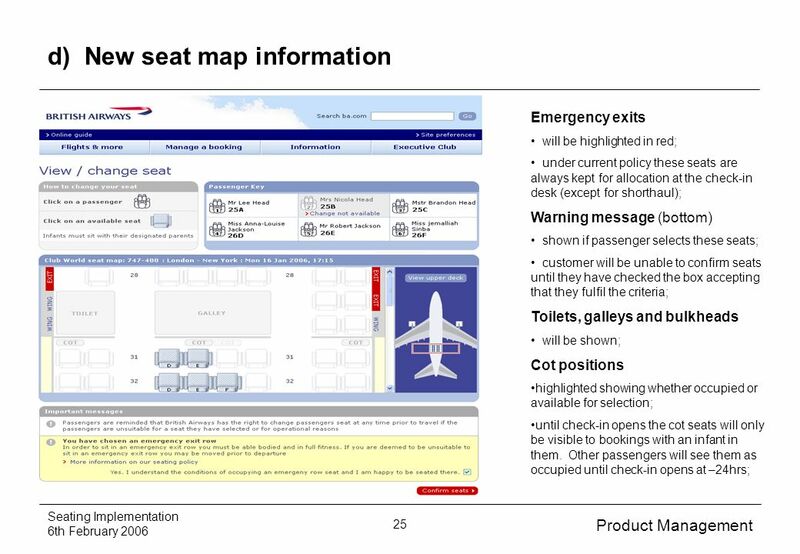 Everyone else - only able to choose seat(s) at time of check-in; However, (perhaps confusingly) the three pages will have the same look and feel to ensure consistency. 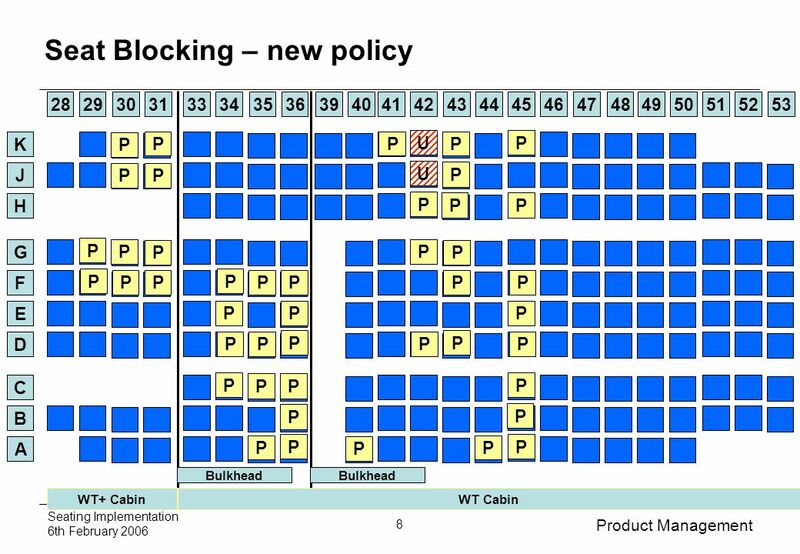 13 Product Management Seating Implementation 6th February 2006 13 2. 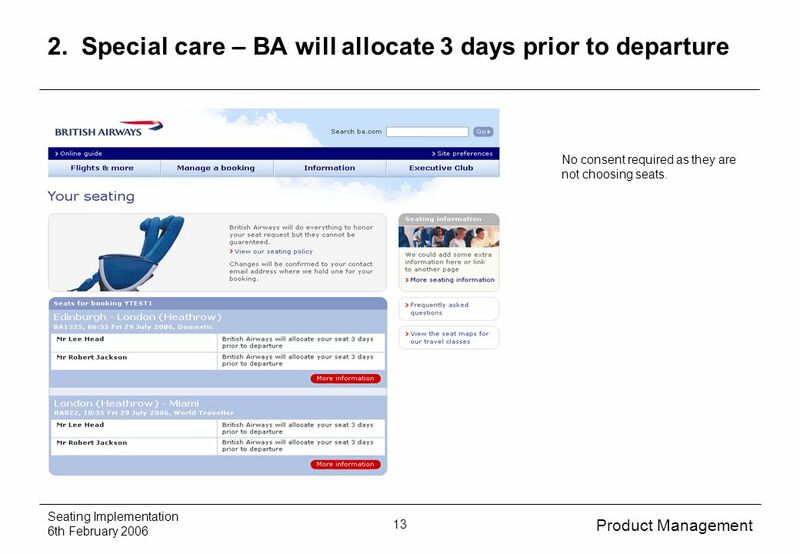 Special care – BA will allocate 3 days prior to departure No consent required as they are not choosing seats. 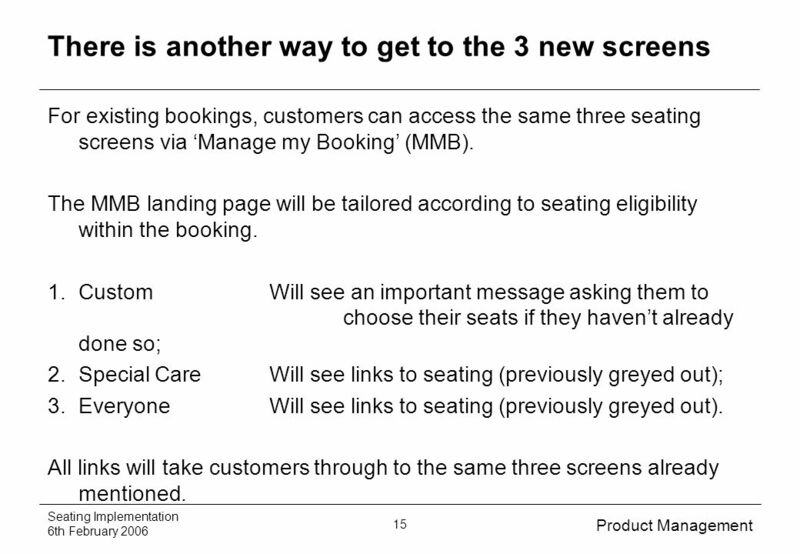 15 Product Management Seating Implementation 6th February 2006 15 There is another way to get to the 3 new screens For existing bookings, customers can access the same three seating screens via Manage my Booking (MMB). 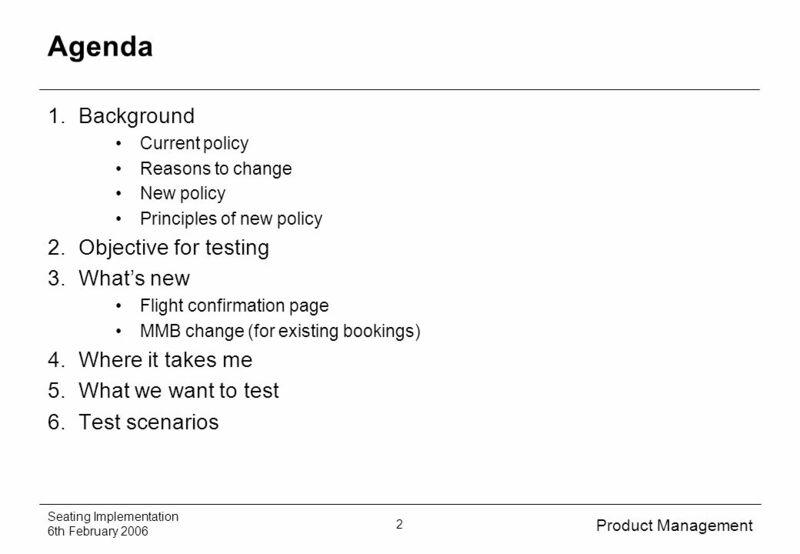 The MMB landing page will be tailored according to seating eligibility within the booking. 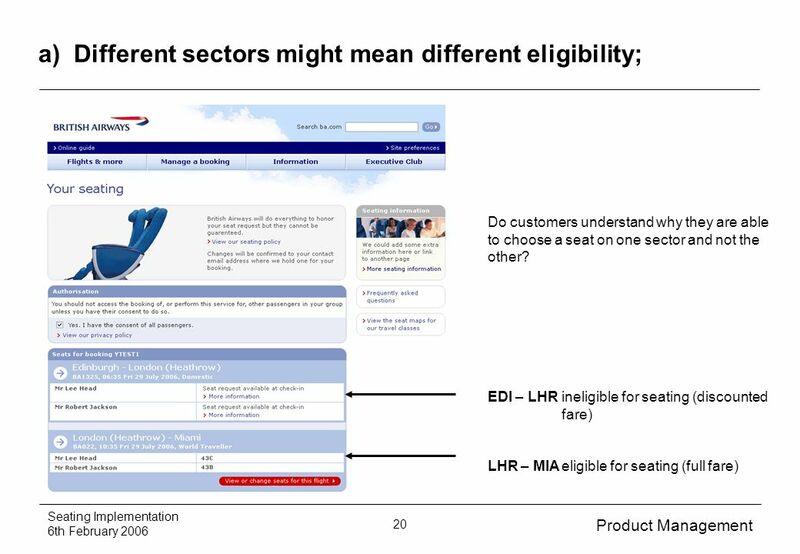 1.CustomWill see an important message asking them to choose their seats if they havent already done so; 2.Special CareWill see links to seating (previously greyed out); 3.Everyone Will see links to seating (previously greyed out). All links will take customers through to the same three screens already mentioned. 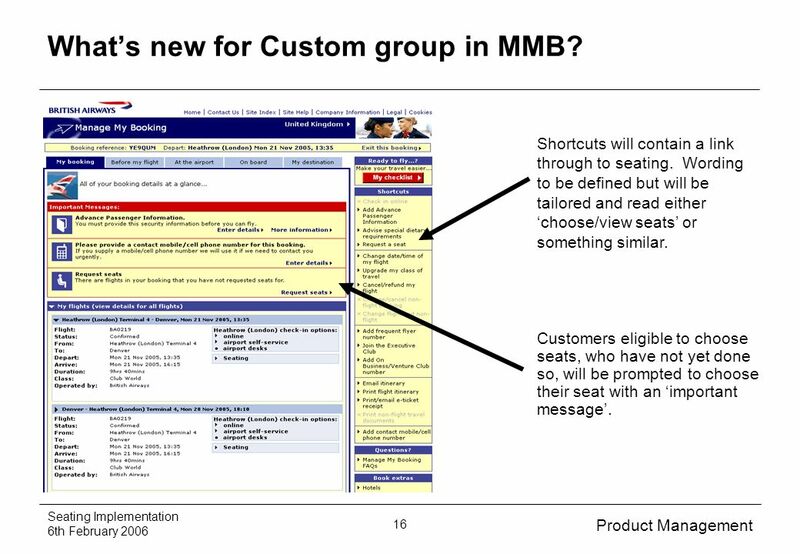 16 Product Management Seating Implementation 6th February 2006 16 Whats new for Custom group in MMB? 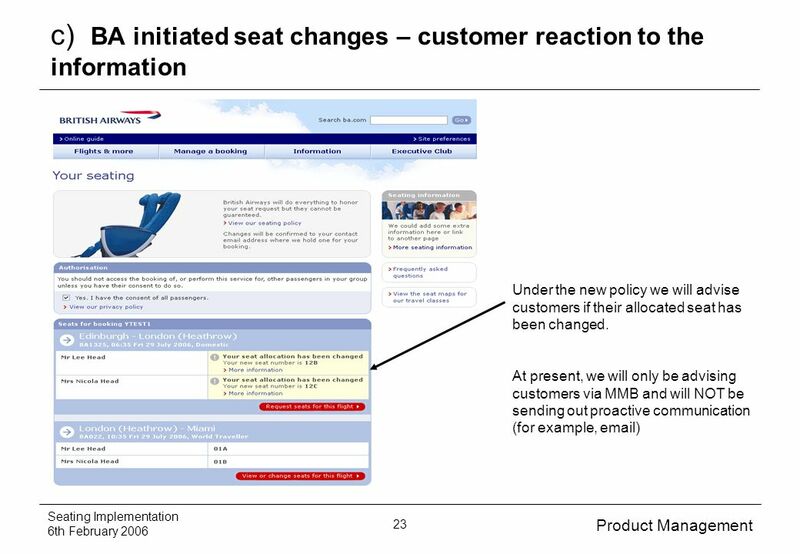 Customers eligible to choose seats, who have not yet done so, will be prompted to choose their seat with an important message. Shortcuts will contain a link through to seating. 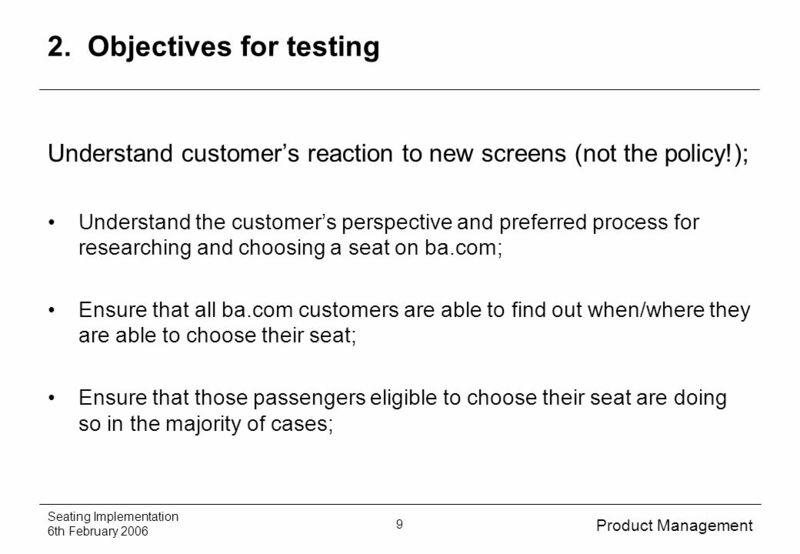 Wording to be defined but will be tailored and read either choose/view seats or something similar. 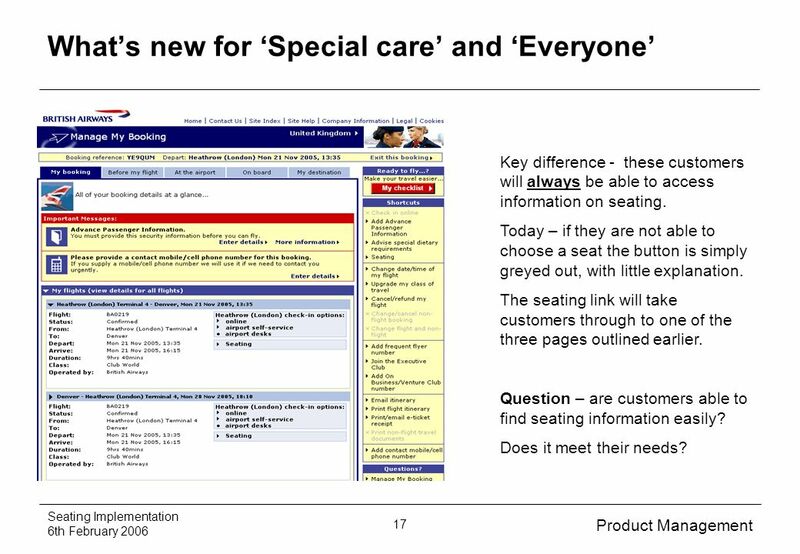 17 Product Management Seating Implementation 6th February 2006 17 Whats new for Special care and Everyone Key difference - these customers will always be able to access information on seating. 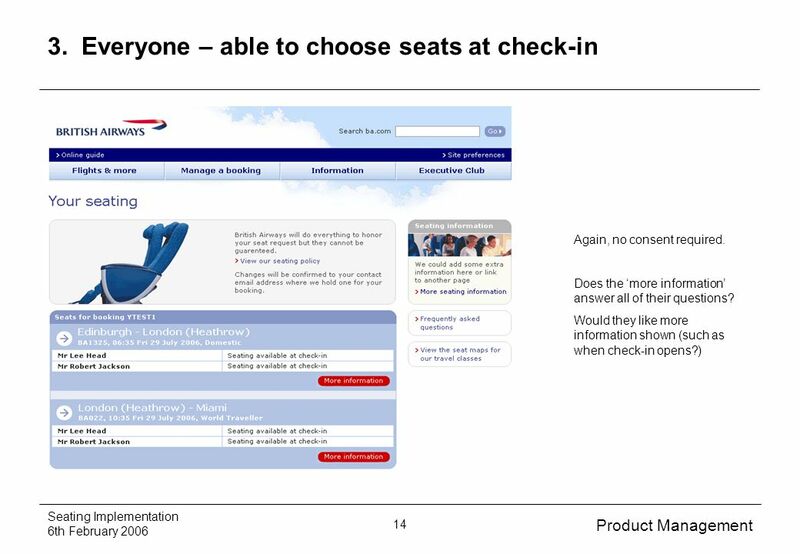 Today – if they are not able to choose a seat the button is simply greyed out, with little explanation. 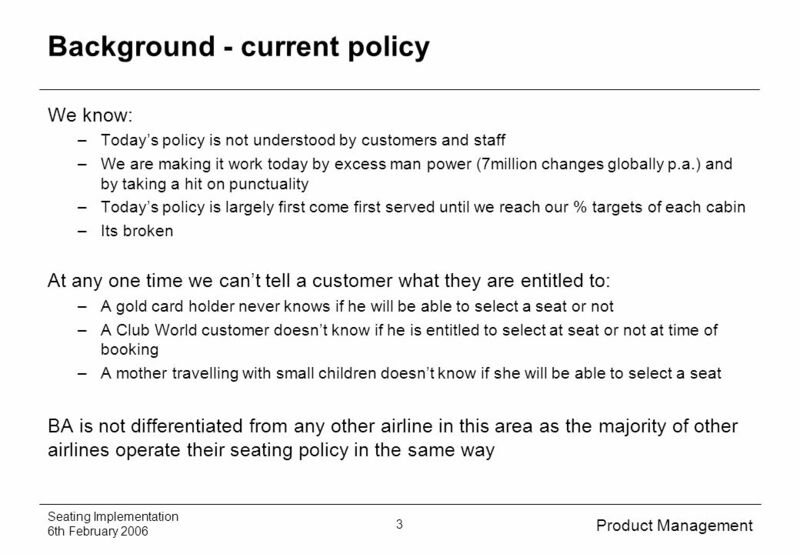 The seating link will take customers through to one of the three pages outlined earlier. 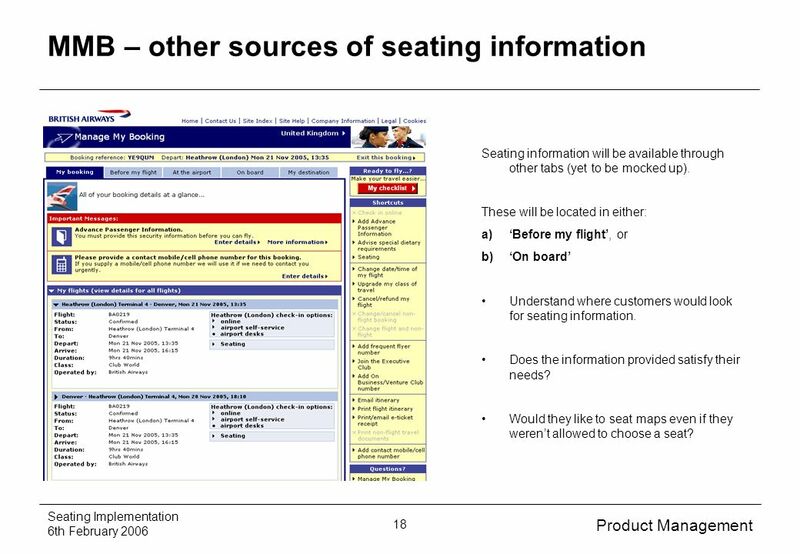 Question – are customers able to find seating information easily? Does it meet their needs? 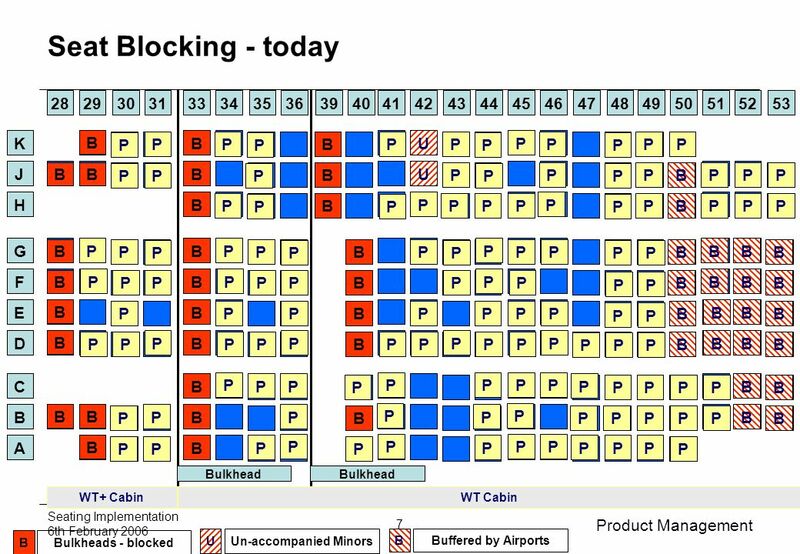 18 Product Management Seating Implementation 6th February 2006 18 MMB – other sources of seating information Seating information will be available through other tabs (yet to be mocked up). 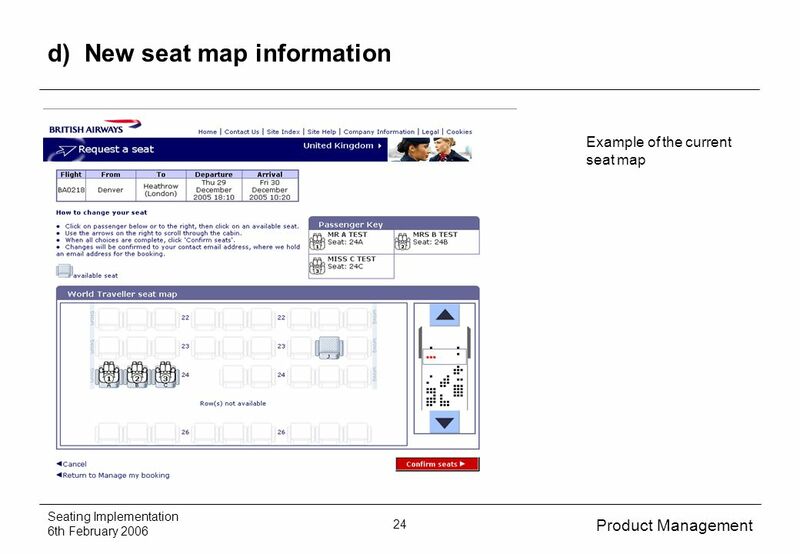 These will be located in either: a)Before my flight, or b)On board Understand where customers would look for seating information. Does the information provided satisfy their needs? 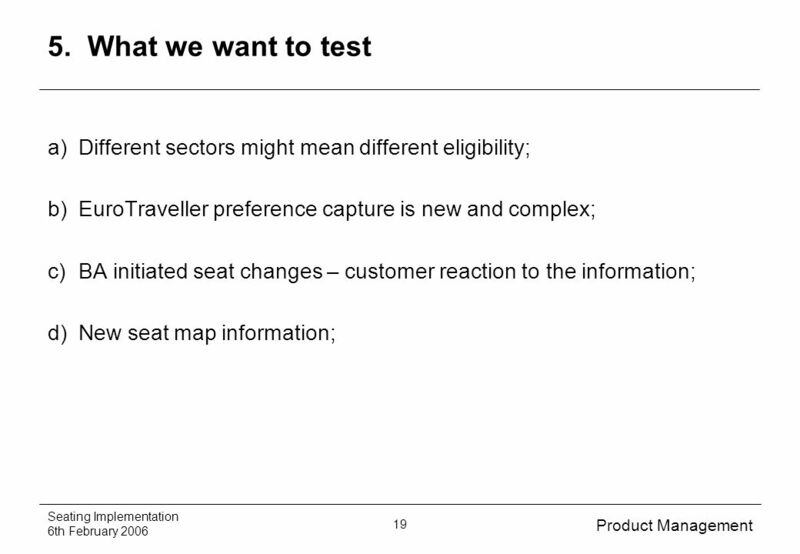 Would they like to seat maps even if they werent allowed to choose a seat? 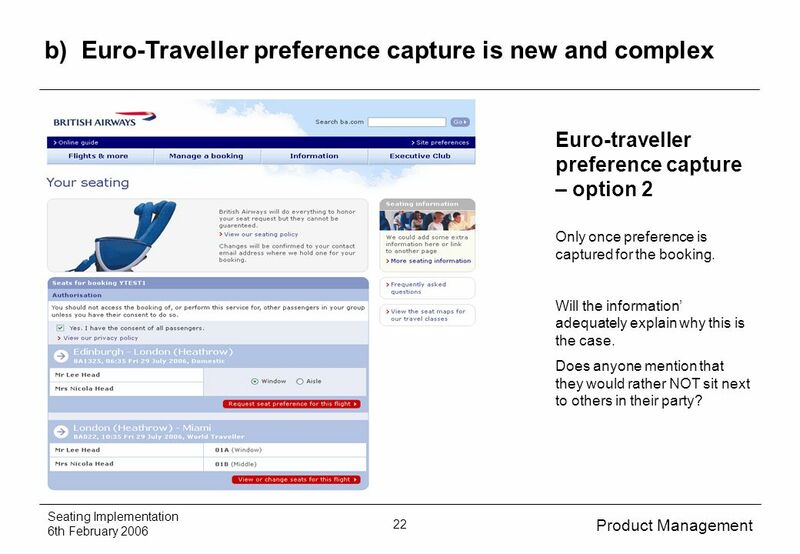 21 Product Management Seating Implementation 6th February 2006 21 b) Euro-Traveller preference capture is new and complex Euro-traveller preference capture – option 1 In line with our competitors, BA do not offer any pre-seating in the Euro- traveller cabin because of the complexity of the moving curtain Preference is requested for each passenger in the sector. Do they work out that they potentially wont be sitting next to each other? Does the information adequately explain the process? 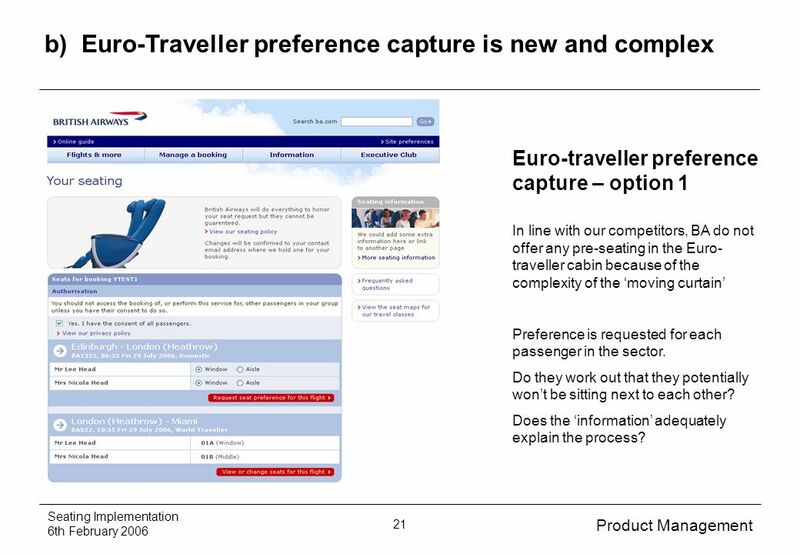 22 Product Management Seating Implementation 6th February 2006 22 b) Euro-Traveller preference capture is new and complex Euro-traveller preference capture – option 2 Only once preference is captured for the booking. Will the information adequately explain why this is the case. Does anyone mention that they would rather NOT sit next to others in their party? 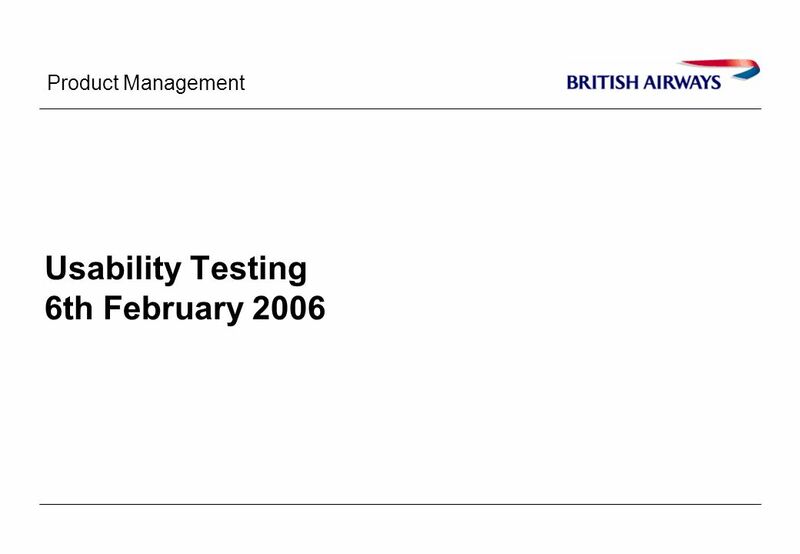 Download ppt "Product Management Usability Testing 6th February 2006."